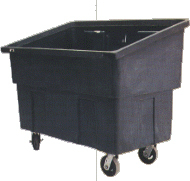 Heavy Duty Multipurpose Polyethylene Tote is constructed of gray polyethylene and come with steel lifting bars for use with the Multi-Purpose Tote Dumpers, steel reinforced bottom Specs: Holds approximately 1/2 cubic yard of material, 4 - 6" x 2" swivel mold-on rubber casters, and overall dimensions are 35" wide x 53" long x 42" high. Available in 200 or 600 Lbs. Capacity. Capacity: 600 lbs (+$200.00)200 lbs.